Since 2010 I've been privileged to score award shows for a number of events around the world. I try to create dignified and powerful soundtracks to create an joyful and heartfelt atmosphere. For the Equator Prize awards ceremony in Paris 2015 we used a song I had recorded with a few friends for the grand finale. Alec Baldwin was tremendous as host and I’ll never forget the smiling faces of the award winners on stage at the end of the beautiful ceremony. The 2014 Equator Prize awards ceremony was held at the former Avery Fisher Hall at the Lincoln Center. 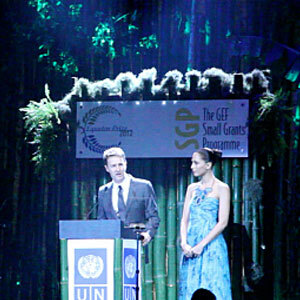 Edward Norton returned to host along with Connie Britton; Jane Goodall, Al Gore and Jeffrey Sachs provided words of wisdom and celebrities like Carla Cugino, Kyra Sedgwick and even Linkin Park made sure that photographers showed up on time! Stunning event for all the right reasons and compliments to the organizers for doing an impressive job pulling off this inspiring event. Here’s a short reel with a few soundtrack samples from Rio+20 and the 2014 New York awards ceremony. Video introduction used as invitation for the David Geffen Hall event. Here are some of the soundtracks I prepared for the awards ceremony and below you’ll find one of the highlight videos from the awards ceremony. Equator Prize 2012 – Winners from Equator Initiative on Vimeo.